Dr. Farhad Hakim is a general dentist who graduated from Howard University College of Dentistry in Washington D.C. with a doctor of dental surgery (DDS) degree. He was among the top ten of his graduating class and was on the Dean’s Honor Roll. Dr. Hakim completed his general practice residency (GPR) at Medical College of Virginia and McGuire Veterans Affairs Hospital in Richmond, Virginia. 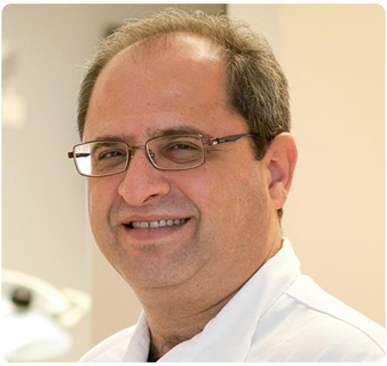 Following his residency, Dr. Hakim opened Herndon Dental Center in 2002 in Fairfax County, Virginia. Through the years, Dr. Hakim has attended advanced trainings in all phases of general dentistry, including two years’ maxi course in dental implantology at Howard University in 2003 and advanced straight wire orthodontics at the American Dental Institute in 2006. He completed training for the diagnosis and treatment of TMJ disorders at Bay Area Center in Tampa, Florida, and he has attended trainings at the Las Vegas Institute and Scottsdale Dental Institute. In addition, Dr. Hakim has attended several continuing education courses in implantology, including mini-implants and Bicon dental implants, as well as aesthetic dentistry, oral surgery, bone grafting, and sinus lift at Medical University of South Carolina School of Dentistry. He is also certified in orthodontics, Invisalign®, TMD, and management. Dr. Hakim is fluent in English, Farsi, and Turkish, and is familiar with Spanish.